Def Leppard and KISS ended their 42 date Summer Tour 2014 last night in Houston, TX in front of another sold out crowd. The final show took place at Cynthia Woods Mitchell Pavilion and may not be the last time the two bands play together. KISS have mentioned over 600,000 fans attended the shows with more still to come "possibly" elsewhere. This may be directly related to Joe's tour update from 22nd July when he said - "I think we're gonna head off Down Under first to Australia, Japan." when talking about the 2015 world tour dates. Phil and Joe also posed for a backstage photo with members of KISS and The Dead Daisies after the show ended. Joe appears to have got some good rock memorabilia to add to his collection!. Joe shared KISS intro duties with their regular intro guy Francis Stueber who posted a photo of him from his side stage area - shown below. 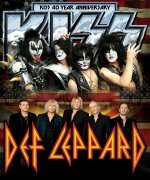 The next Def Leppard show (without KISS) takes place on 4th September in Mexico City. Special thanks to our great friends and tour mates @def_leppard who ROCKED the house every night! AND we're not done yet! KISS Army...The numbers for the US 40th Ann. Tour say it all! 42 shows. Over 600,000 fans. Amazing & thank YOU! MANY THANKS to @def_leppard We really had a GREAT time! Fantastic guys.